A: Leh (Main) 05:10 min. B: Leh (Dub) 05:30 min. 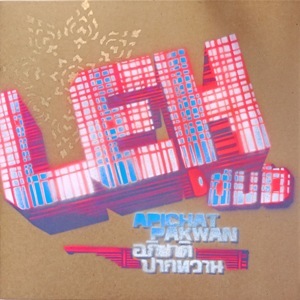 Leh Dub is the third single of innovative Thai/Dutch collective Apichat Pakwan. Their latest creation is an exciting next step on their path of producing and performing contemporary Thai music & dubbed-out electronics, focussing on the Central-Thai musicgenre ‘Leh’. Leh has its roots in Buddhist chanting (which is called ‘Thaen’), traditionally by monks who tell the history of Buddha. The most traditional form is called Leh Nai and strictly follows the Buddhist readings. It is performed at home by a monk before a young man spends some time in a temple to study Buddhism. Leh Nok is a more improvised and free style of Leh by local singers. Apichat Pakwan’s Leh is based on the last style, and is originally called ‘Leh Srika Sang Nahk’, usually sung by the wife of the man who is about to become a monk. trademark of the group. Apichat Pakwan’s innovations are even more remarkable considering the conservative character of Thai traditional music culture. on the traditional Lao mouthorgan (kaen). Their new interpretation of Leh already received critical acclaim in and outside Thailand during the live performances of the group in 2018. The B-side continues the format of Apichat Pakwan’s previous 10”s, and is again a deep one. After the intro anouncement of singer Wiw, the crushing drums and driving bassline form the foundation for a stripped-down yet electrifying dub version with spatial, sparse vocal excerpts, leaving enough space for slow developing polyrhythmic patterns and atmospheric, constantly moving synthchords.